Last month I was lucky enough to make it to my local Best Buy in time to buy a new iPad 2 on launch day. After a month of using it at home and on the road, I am very happy with the purchase and thought I’d share my findings. Last year, when the original iPad came out, I already had a Mac Book Pro and iPhone 4, so as Louis Gray wrote last year, I had picked my two. I had the opportunity to play with a few iPads and was getting iPad-envy reading articles about families using the new device. I was even seeing the iPad discussion come up at work as more business applications came out for the platform; the iPad was named one of the top two infrastructure innovations of 2010 by Wikibon’s CTO. I was still struggling a bit with justifying the purchase; was it just an expensive toy and would I need to carry yet another device and charger? The clincher for me was that I have a lot of travel to conferences and analyst events this year. The light weight, small form factor and long battery life (listed at 10 hours) would allow for more productivity on planes and less back strain walking around events. 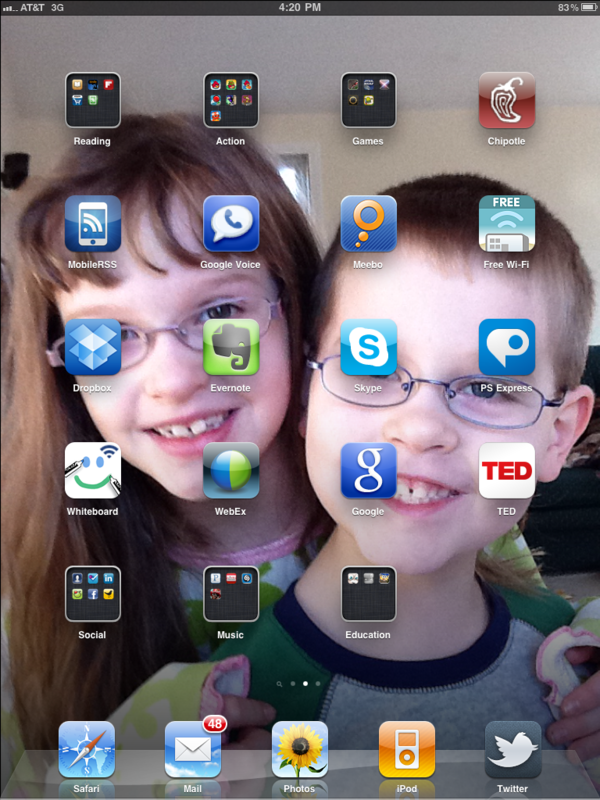 Above is a screen shot that shows my iPad with most of the apps that I have. I am very happy traveling with the iPad. The battery life is awesome, I have yet to have a day that a full charge hasn’t lasted for my usage. On planes, it’s a fully functional iPod (good for movies too), eReader, notepad (I use Evernote), and game player. Of course WiFi helps since you can’t utilize 3G on planes. At conferences and meetings, I can take notes, use social media, or surf the web. While the OS for the iPad is the same as an iPhone (see some good tips that work on both devices here), there are a few differences worth noting. On the positive side, browsing the web and multimedia apps are generally much better. Apps like Flipbook or even websites like WordPress (including this blog) that are optimized for the iPad are immersive with the touch interface. On the negative side, I’ve found apps crashing much more on the iPad than there are not a lot of free apps that are optimized for the larger screen. For Twitter, I use TweetDeck on my desktop and phone, but it has been too unstable for the iPad, so I’m using the native Twitter app (note that I’ve put it in the home bar for easy access). The knock on the iPad has been that it is a consumption, not creation device; I have found that it’s adequate for drafting blog posts, creating emails, using Google Docs or even giving a presentation. Back at the office, my laptop is still the primary device for all creation activity. There are a few other limitations that I’ve run into: lack of Flash does limit some web activity and opening zip files requires an app and jumping through some hoops. I use email and Dropbox to get files on and off the device – creation of presentations and reports are somewhat limited by not having the usual archive of information that is typical on a desktop/laptop. While I find that the iPad is sufficient for a day of meetings/trade shows, I have still been using my laptop in the evenings. At the office, I rarely touch the iPad, defaulting back to the laptop which I can type faster and don’t have any of the limitations mentioned above. At home, I’m still sorting out when I use the iPad instead of the laptop or phone. My kids (5 & 7) love the iPad and I feel more comfortable letting them play with it than I do the iPhone. They are both adept at playing games (and have caught my Angry Birds addiction), using some of the educational and art apps – the touch interface is so intuitive. The iPad is ideal for taking on errands, giving a parent or child something to do while waiting. I have the 3G version (I have the $15 250MB plan from AT&T and was under 200MB my first month), and just make sure that I’m not doing lots of video when not in a WiFi area. The 3G version makes a decent GPS device for a passenger to help navigate. While lack of Flash does limit video from some sites, YouTube and other apps (like TED) are great for watching video. Facetime is a nice idea on both the iPhone, iPad and even on the Mac, but I’ve used Skype video works well. In testing Facetime with Stephen Foskett, we find that it looks better on the small screen of the iPhone and angling the forward facing camera on the iPad is difficult. The quality of the cameras seem to be the same as the iPhone 4, not great, but fine for 4×6 prints or posting videos to Facebook or YouTube. I do recommend the “smart cover” (I got polyurethane), it helps save battery life by shutting off when closed and makes a good stand for typing or watching video. I also recommend a neoprene case (I got one designed for a netbook) to provide some extra protection, is easy to carry or throw in a laptop backpack. Overall, the iPad provides a much more immersive and enjoyable experience than a smartphone and is much more portable and fast to use than a laptop. While I do think that the iPad is a big step towards moving to a post-PC world, we’re still in the early days of the era of tablets, so hopefully there will be a lot of new uses and innovations that will allow us to do things that we never imagined of for the previous devices. What cool things have you done with an iPad that you couldn’t do with a smartphone or laptop? I’m sure there are thousands of cool apps that I should be checking out, let me know what I’m missing. You are currently browsing the Blog Stu - Stuart Miniman blog archives for April, 2011.